The November issue of the UN Environment Programme's (UNEP)'Our Planet' magazine focuses on the interactions between biodiversity, climate change and protected areas. 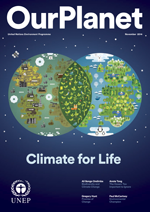 The issue contains 11 feature articles and provides highlights of UNEP's work as well as country-level action on climate change mitigation and environmental conservation. The UN Environment Programme Executive Director, Achim Steiner, opens the publication. This is followed by feature articles by Ali Bongo Ondimba, President of Gabon, Anote Tong, President of Kiribati and Razan Khalifa Al Mubarak, Secretary General of the Environment Agency, Abu Dhabi (EAD), the United Arab Emirates (UAE), among others.